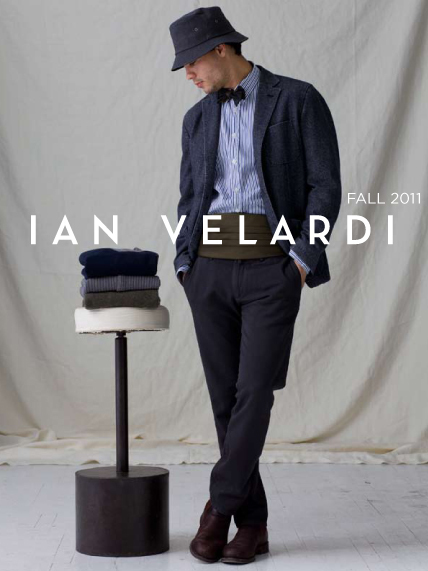 Creating a promotional video for his debut collection was no difficult task for Ian Velardi. Well, at least it doesn’t appear that way. The style of this video reminds me of the keen eye of photographer extraordinaire, Bruce Weber with its slick, suggestive feel. While having a beautiful model scantily dressed trying on various garments is nothing new, it’s the overall vibe of the video — directed by Roy Eventov — that makes it a cut above. I particularly like how the band featured in the video were spotted in a subway stop and were approached to be a part of the film. There’s a certain aura to their presence in the video that would be missed if they were absent. This entry was posted in Collections, Feature, Knitwear, Pants/Bottoms, Suits, Tops, Uncategorized and tagged Ian Velardi. Bookmark the permalink.